MyFitnessPal is one of the most popular web-based exercise and fitness social media applications available. MyFitnessPal (MFP) helps you keep track of your daily food and beverage intake, calculating all your nutrients, calories, and vitamins for you. This enables you to analyze patterns and find out what your diet is missing or where you need to cut back a little. MFP’s “HelloHealthy” blog is loaded with great recipes, workouts, and tons of health and wellness tips. MyFitnessPal also connects with many of the popular activity tracking devices and mobile apps such as the Fitbit, the Lumo Lift, and the Polar Loop. These devices can track your steps, calories burned, active time, and more. 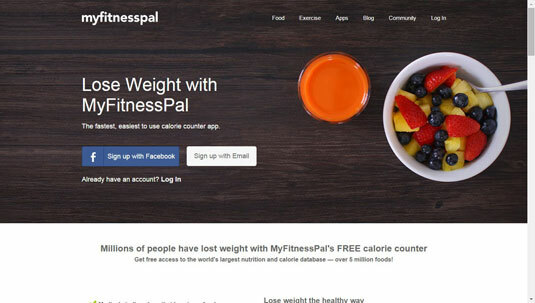 Beyond all that, MyFitnessPal offers a Facebook-like community section. Here you can find and follow friends, share your workout and food diaries, and get motivation, inspiration, and accountability for your quest. One reason MyFitnessPal is so popular is that it is 100 percent free! No “free trials” or bait-and-switch premium editions here, no sir. Just put up with a few ads and you’re good to go. Regardless of your exercise habits, nutrition is the primary factor in maintaining a healthy weight. MFP knows that, and that’s why they put a lot of focus on the Food Diary. They’ve clearly put thought into convenience, which is good because keeping detailed track of your food is a real pain in the patoot. 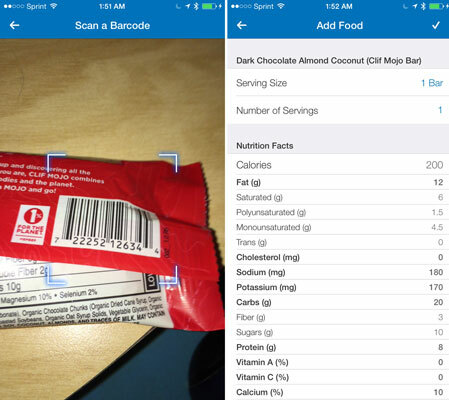 If you eat a lot of packaged or prepared foods, your life is simple — just scan the barcode, and you’re done. You might even enjoy it. Nutrition experts generally agree a healthy diet contains a balance of about 40 percent carbs, 30 percent protein, and 30 percent dietary fat. 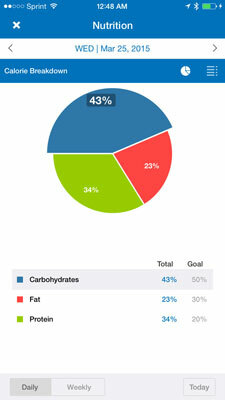 On the mobile app, you can view a summary of your nutrition for the day or week at a glance as a pie chart to quickly judge how well you’ve kept to that ratio. Some very smart code writer gets kudos from this impatient and lazy typist for developing my favorite MyFitnessPal feature, the Recipe Importer. Think about this: you find a great recipe online (or elsewhere) you want to try, but you’re not sure how to log it in your diary. You want to be true to your nutrition journaling, but the recipe just doesn’t give you that kind of information. MFP to the rescue! 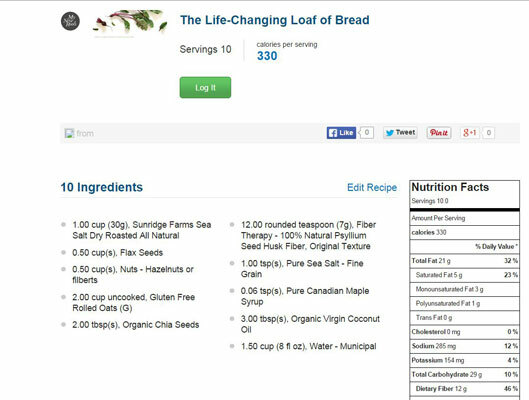 Plug in the URL for the recipe (or type in the ingredients and total servings) and click Import Recipe. Wait a few seconds, and voila! MFP crunches some data and spits out on the screen the familiar Nutrition Facts you’ve grown accustomed to seeing on products. And you can log a serving of it directly from this screen, before you forget! And now the recipe is in your database, so you won’t have to ever go to “all that trouble” again. No matter how great a tool is, there is no magic wand where exercise and nutrition is concerned. You still gotta do the work to get the results. So get out from behind your computer and get moving!